"A Japanese visitor said miso soup is a classic breakfast soup and I thought why not add oatmeal instead of tofu. Now it's a must each morning for me and much more satisfying than a green smoothie or sweet oatmeal!" Bring water to a boil in a saucepan; add oats and miso paste. Cook for about 1 minute. Add spinach, walnuts, and seaweed to oat mixture; cook, stirring occasionally, until oatmeal is desired consistency, about 5 minutes. 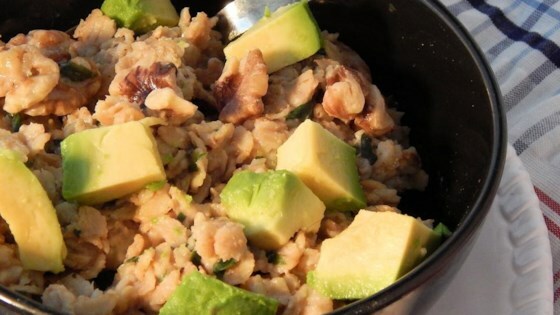 Pour oatmeal into a bowl and top with avocado. For breakfast or beyond, this bowl is brimming with good protein and flavor! I always use organic red miso paste, but you can use any miso paste available at most Asian markets or Whole Foods®. You may even add a bit of tofu just before serving for added protein. I should have added that BEFORE serving, add the walnuts and avocado and not during cooking process. Thanks people! !